Whether you’re looking for a flat, sloped or pitched aluminum walkway cover, Perfection Architectural Systems, Inc. provides expertly engineered and constructed aluminum projects in Louisiana. 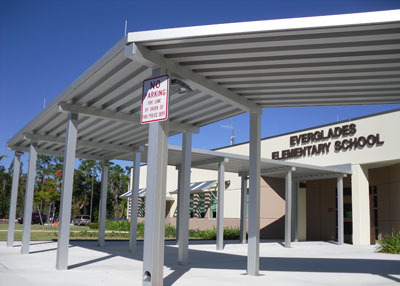 We offer customized solutions for your aluminum walkway cover requirements, creating a product that adds quality to your site while providing a unique look. Perfection designs every project specifically for your needs. This includes all the building code requirements mandated by the state of Louisiana. As well as, engineering your aluminum walkway covers to withstand snow, wind, and other severe weather conditions. Projects are catered for your preference in finish durability and color selection. All of our aluminum walkway cover structures are developed with the Perfection Rigid Roll Lock Deck System. This extruded aluminum design insures that the deck components are securely attached to each other, eliminating potential installation errors and providing years of maintenance free service. Implemented in 1993, our Rigid Roll Lock Canopy Systems have withstood the winds of Lousiana’s toughest hurricanes. Don’t settle for less when choosing a company for your aluminum walkway project in Louisiana. Perfection Architectural Systems teamed with Glendale Enterprises has a seasoned, proficient staff of designers to ensure your finished project is exactly what you envisioned. Together, we have set the new standard of quality and professionalism with aluminum walkway covers in Louisiana. Contact Glendale Enterprises, the certified aluminum walkway cover dealer in Louisiana, at (504) 467-5441 or contact Perfection directly at (800)238-7207 and get your next aluminum walkway cover project in Louisiana started.